Summer precipitation and temperature regimes have been compared along the coastal-inland gradient in three sites (Tor Paterno and Castello in Castelporziano forest and Collegio Romano in inner Rome, central Italy) during the last 15 years (1999–2013). Soil water budget using rainfall, evapotranspiration and maximum water capacity of the soil was calculated according to Thornthwaite–Mather approach for the two forest sites. Meteorological conditions during the dry season were found significantly different in the three sites with minimum temperatures increasing from the coastal site (Tor Paterno) to the inland area (Castello and Rome). Maximum temperatures showed a less marked coastal-inland gradient. Cumulative summer rainfalls (accounting for less than the 10 % of annual precipitation) were comparable in the three sites along with a high variability. Although soil water budget variables (available water content and water deficit) were similar in the two forest sites, the aridity index was higher in the inland site than in the coastal site. Despite based on a relatively short climatic time-series, implications of the climate variations observed along the coastal-inland gradient in Castelporziano are discussed in the light of conservation of the residual pristine flat oakwood stands and the traditional agro-forest landscape mosaic. This peer-reviewed article is a result of the multidisciplinary project coordinated by the “Accademia Nazionale delle Scienze detta dei XL”, Rome, Italy, in the area of the Presidential Estate of Castelporziano near Rome. 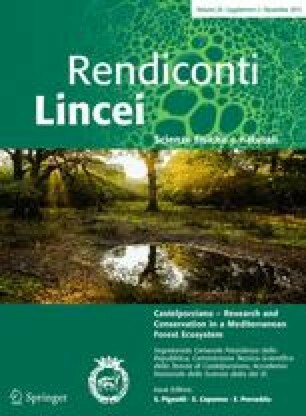 The authors thank the General Secretariat of the Presidency of the Republic, the management of the Estate of Castelporziano, the Technical-Scientific Commission of Castelporziano estate, the National Academy of Sciences and the Observatory of Mediterranean Coastal Ecosystems for financing the present study. Dr. A. Tinelli enthusiastically supported this study over time. Finally, thanks are due to F. Ilardi for the collaboration in data collection.